The newest base of consumers advertisers should get to know are known as Generation Z and they make up roughly 25% of the population, consisting of one of the largest generations so far. Their media consumption habits differ from previous generations as Gen Z does not know a world without technology, enabling them to adapt quickly and embrace new digital developments. Another major differentiation with this tech savvy generation is the way they listen to radio. Gen Zers overwhelmingly prefer connecting to the radio through streaming services in addition to other audio platforms like Spotify and Pandora. These digital platforms offer more music options and shows than ever before. Although Gen Zers aren’t consuming radio in a traditional way, doesn’t mean they aren’t listening, as radio reaches 88% of Gen Z weekly. While this generation can discover a new artist, band or song through a configured playlist on Spotify or Pandora, they tend to reconnect through the radio. Since radio provides a more personal connection, whether that be through on-air live interviews, events and special artist giveaways, this is something Spotify and Pandora are unable to sponsor in real-time. Comparatively, AM/FM radio currently plays a smaller role in Gen Z’s lives than it does in their parents, but some researchers theorize this is because they are not adults and in a different stage of their lives. Yet, two-thirds of Gen Zers report discovering new products, movies and events by actively listening to the radio. In order to capture Gen Z listeners, radio stations like the iHeart community have already adapted their own on-demand streaming app, which consists of traditional radio and podcasts so Gen Zers can listen anytime, anywhere. What is clear is that these young adults care about connecting through digital formats on their own terms. Streaming radio apps provide an opportunity for traditional radio to connect with Gen Zers whether it is through their Amazon Alexa in their living room or through their smartphone on their way to class. Radio, a more personal medium, can only continue to fonder a stronger relationship with Gen Z, as long it can keep up digitally. Spotify vs. Pandora - Which is Right for You? Trying to figure out the differences between Pandora and Spotify audiences is not hard. There’s plenty of data to be found, and even a quick Google search has the potential to overwhelm you with charts, comparisons and statistics. But the important differences between the two giants of music streaming are found in the more considerable pieces of demographic data that keep appearing in every study. Firstly, Spotify listeners are a bit younger and more tech-savvy. Whatever the reasons may be: The Spotify user experience or its’ youthful branding, there’s no disputing it. According to Comscore’s latest numbers, approximately 50 percent of US Spotify users are between the ages of 18 to 34, while Pandora users skew a bit older, with the largest group of users falling somewhere between the ages of 25 to 44 years-old. To put that in one perspective, Spotify users are more likely to use Gmail, whereas Pandora users are more likely to use Yahoo! Mail. To some of you, that may not mean much, but for those of you who are in on the joke, the idea of using Yahoo! Mail, to a younger audience, is culturally verboten. In other words: Yahoo is not the most hip. But that’s okay. After all, 44 year olds are consumers too, and they represent a very important segment of the population. Hawking higher ed? Maybe Spotify is more in tune with your audience. Selling financial services? Perhaps Pandora is music to your ears. But the best part? Both can be segmented, optimized, programmatically placed and highly tailored to your target audience, making either streaming radio service a very savvy buy for any data-driven marketer. If you do decide to add streaming audio to your marketing plan (which you should), be sure to keep one important metric in mind: "addressable audience." An addressable audience means a group of users who listen to their content for free, with ads. Non-addressable means the audience is using the paid version of the audio-streaming app and are therefore listening without ads, and therefore cannot be reached by any campaign. As of now, Pandora has an advantage. Although Spotify recently boasted about 95 million active users within the U.S., while the number of ad-supported Spotify listeners is 65 million users (i.e. addressable). Pandora’s numbers look more like 88 million active users (U.S), with about 71.5 million of those being non-paid, ad-supported and therefore addressable. Despite the fact that Pandora and Spotify attract different audience segments, there is a time and place for each platform to be used. Both platforms have shown growth, continuing to evolve how ads are delivered. This past fall, Spotify teamed up with Warner Bros and experimented with 3D sound and a video ad. The ad mimicked the movie theatre surround-sound effect in order to create a more unique experience and break through the ad clutter. On the other hand, Pandora offers thousands of audience segments to construct ads specifically for your target audience. If you have a smaller budget and a highly-targeted group you’re trying to reach, Pandora may be a better play. In addition to Pandora’s AdsWizz acquisition last May, Pandora continues to enhance their targeting techniques by adding the right players to their team. AdsWizz specializes in programmatic audio advertising; something Pandora has beat Spotify in providing, in the past. When it comes to digital and mobile marketing (streaming audio included) it’s often more important to pay attention to trends rather than current figures. And if you abide by this rule of thumb you must note that Spotify's audience numbers are steadily trending up at a much greater rate than Pandora's. While both Spotify and Pandora both have their pros and cons, the biggest thing to take away is that streaming radio is a fantastic and efficient place to generate highly-targeted user engagement, establish a great branding campaign, or extend and supplement your current marketing plan. Podcasts, an on-demand audio broadcast hosted for free on the internet, have emerged as a major opportunity for advertisers to reach a captive audience. The word ‘podcast’ originated in the early 2000s, as a combination of the Apple iPod and the word broadcast. At the time, podcasts were available through the iTunes store and downloaded by listeners onto their personal devices to listen to on-the-go or at a convenient time. Since then, podcasting has evolved into a major player in the audio arena and podcasts are now available on all types of internet-equipped devices. Podcasts are popular among all generations, with close to 25% of the US adult population listening to at least one podcast in the last month. In 2006, 22% of the US adult population knew what a podcast was, but by 2017, 60% were aware of the podcast popularity. Of that 60%, 96% of those surveyed aged 18-29 were familiar as well as 93% of those surveyed aged 60+. The medium proves interesting to listeners due to its great accessibility. Firstly, podcasts are free to download. There are no prohibitive income barriers like what can be found with other formats: all you need is an internet connection. Secondly, podcasts are portable, they are available on mobile and tablet devices. One of the reasons podcasts are so popular? Well, upon downloading the content, they afford the listener the freedom to listen on their own schedule: whenever or wherever. Research shows that the majority of users choose to listen to their podcasts on portable devices, however, one-third of listeners opt to listen via desktop, particularly while working as a distraction-free way to pass the day. Researchers predict that in 2019 there will be 79 million podcast listeners in the US alone. By 2021, that figure is expected to grow to 112 million listeners. Podcasts have shown tremendous growth since their accessibility through hand-held devices in 2004, with no signs of slowing down. New podcasts are created weekly and new creators are continuously entering the market. Podcasts also offer a unique opportunity where advertisers can be exposed to loyal, affluent, and educated listeners. Several advertisers are already present on podcasts – and the number keeps growing as it is a market that one cannot ignore. Today, even with all the available analytics tools at our fingertips, it still isn’t always clear which advertising channels are yielding the best outcomes. But most would agree that some feedback is better than none when analyzing advertising results. While a little late to the game, radio advertising recently launched its own analytics tracking program. Companies like Owl Analytics have started providing a similar product where they track Google searches for a brand’s radio commercial immediately after it airs. At the local market level, these services track branded Google searches within an eight second window. We have found it a useful tool to help clients improve their advertising strategies. Which station or stations generate the biggest lift in Google searches? What creatives/commercials are having the biggest impact? Tracking engagement by time of day and day of the week. Bench-marking results against industry/category averages. Similar to any analytics tool, alone, it tells only part of the story. However, for the first time, radio can provide some insights to illustrate what works best and to create a path to optimize results. Perhaps best of all, radio analytics reporting is available at no charge to advertisers, and may just offer priceless results. Nowadays, there are more online shoppers than ever before. Marketers concentrate their advertising efforts in the online realm hoping to steer those shoppers to their websites. But, what exactly is spurring them to go there in the first place? There are several advertising mediums out there that claim to be the reason behind the drive to search online, but there's one that's stands out in the crowd. A recent study commissioned by the Radio Advertising Bureau and performed by Sequent Partners showed that radio advertising generates, on average, a remarkable 29% incremental lift in Google search activity. So, how do you suppose radio is accomplishing this feat? Here are three reasons why radio ads can increase curiosity to a brand, product or service. The RAB study reported that the highest searches occurred during the morning and midday hours, precisely when people are commuting to work and running errands. Most audiences listen to the radio in their cars or while getting work done at home. According to the study, morning hours noticed a 33% increase in online search activities, while midday hours increased by 32%. Radio listeners like to enjoy music, which can uplift or inspire them throughout the day. When the music stops and the commercials start, listeners don’t just completely tune out. Audiences continue to remain attentive to what's being said, even if they're doing other things. If something sparks their interest, listeners often grab their phone and search online. The more listeners hear the same advertising message, the better they will remember the product or service too. The use of radio personalities have long been a popular and proven method for increasing sales. People listen to their favorite radio hosts and sometimes even follow them for years as they relocate from station to station. As listeners get to know the person behind the mic, they tend to value and trust their opinions more. When radio personalities promote a product or service, it is as if it comes with their seal of approval. The RAB study also makes it clear that radio is the number one reach medium for advertising. If you're not using radio in your marketing campaign, then you should consider it. A 29% lift in online search is no laughing matter when you want to increase your brand awareness and profit margins. With the overwhelming popularity of social media and mobile technology that both reach massive audiences with minimal effort, it isn't surprising that some believe radio is no longer the entertainment titan it once was. Despite this concern, new findings from Nielsen Media Research suggest that radio (and radio-based marketing) is far more relevant than you might think. According to the Nielsen Total Audience Report: Quarter One, 2018, on a weekly basis, millennials spend more time listening to the radio than they do using social media applications on smartphones. While Nielsen's report claims that as many as 60 million millennials use their smartphones for social networking, it also found that even more listen to the radio—approximately 69 million in total; in other words, 82% of millennials use social media apps on a weekly basis while 91% of millennials regularly listen to radio broadcasts. 91% of millennials regularly listen to radio broadcasts. The Nielsen Total Audience Report also compared radio to television-enabled devices and computers with internet access. The report found that radio has both the largest reach of the three—91%, compared to 59% and 62% respectively—and, on average, is used the most by millennials during a typical week. To reach this conclusion, Nielsen looked at the average number of minutes a typical millennial uses each device during a normal week: internet is accessed around 270 minutes a week, television roughly 525, and radio nearly 600. Nielsen's findings demonstrate that the reach of radio broadcasting should not be underestimated. Despite the ever-growing popularity of social media, smartphone technology, and internet-based advertising, radio still plays a notable role in the average person's weekly routine—even if they're a millennial. Think back to the summers of your youth. There was always the one song on the radio that defined that summer, and all the emotions and good times that went with it. Summer and great tunes go together like beach volleyball and bikinis, and there's no reason for your business to be standing on the sidelines. Here are three reasons why the dog days mean loads of radio listeners, eager to hear all about your business. Playlists don't give beach traffic reports. There are some things streaming just can't do, like give you the latest beach traffic, summer weather, or updates about events happening around town. People need to tune in to their local radio stations in the summer to get the information they need. "radio provides the local flavor and personalities that are just the right mix for summer fun." Let's face it, radio is the perfect companion on your summer road trip. When you're traveling, checking out the local radio stations is one of the best ways to get to know the area. Whether it's a cross-country road trip or just a jaunt to a nearby sporting event, radio provides the local flavor and personalities that are just the right mix for summer fun. When people are at the beach, gardening, or just hanging out in their backyards, radio is a carefree way to spend hours enjoying their music outside. The continuous variety of songs keeps everyone happy during their favorite summer activities, and no one will get sick of a playlist on repeat. People working outside also rely on radio to keep their day moving in the summer heat, and local advertisers are front and center as people go about their summer days with the radio by their side. Interest in local radio stations peaks during the hot summer months. Your business is poised to take advantage of all those attentive listeners with a creative advertising package designed specifically for this season. These days nothing is simple. Cars are driving themselves, Amazon’s Alexa is telling me what to wear to work, and the first robot citizen, Sophia, is dating more celebrities than I will ever have the pleasure of meeting. Technology continues to blend into every part of our lives, but with all these new accessories, it’s important to leave room for the technical glitches and latest versions in order to stay up-to-date. As radio approaches its' 100th birthday, it seems to be the only simple constant in the equation of media platforms. Today, many of us feel increasingly addicted to their phones, but radio has always remained a loyal friend. In fact, 93% of the U.S. population listens to AM/FM radio even without including digital listeners, and the numbers continue to climb. The statistics speak for themselves…as radio rakes in one of the largest audiences and is one of the few mediums we don’t consistently need to learn how to use. There are no new updates, just new platforms where the medium integrates well with new technology, creating more opportunities for us to listen and for advertisers to get their message heard. Aside from traditional AM/FM radio being simple, it’s also friendly. Researches note that radio gives listeners a sense of companionship, providing mood enhancement features. In the end, unlike social media, traditional radio is never deceptive, depressing or difficult to use. Radio is simple and with the number of listeners they currently have, is it clearly appreciated. Radio is an important part of teens and 'tweens daily media mix. Radio garners the most of their time spent listening to music, compared to time spent listening on smartphones and other devices. New Nielsen Audio research shows that radio weekly tune-in time is high—over 14 hours on average to be precise. And this data isn't just limited to one demographic. Radio tune-in time is high across all Americans and is, in fact, higher among certain audience segments like black and Hispanic Americans. Eighty-two percent of all American drivers use AM/FM radio while in the car. It’s astounding to think that radio is the only media that does not require our full attention—it’s unique in that way. As long as we have cars, radio does not seem to be going anywhere anytime soon. Social media is often thought of as a ubiquitous content vehicle. However, AM/FM radio reaches nearly 25% more adults each week than social media does. Americans listen to radio in their cars an average of 73 minutes a day. Commuters are already especially pressed for time. So the more they can do on their commute, whether in their car, on the bus or on the train, the better. Radio allows us to listen to news and entertainment and discover new music. It gives us more time to get things done while on the go. 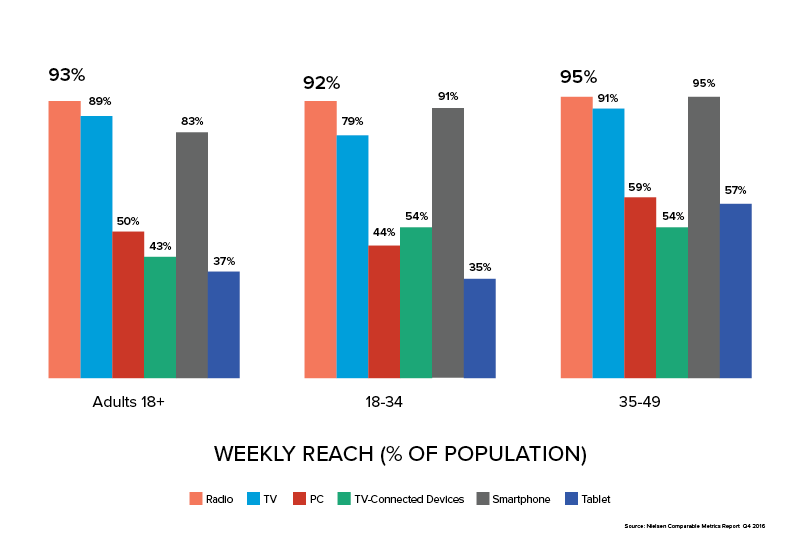 In comparison to TV, desktop, TV-connected devices, smartphones, and tablets, radio reaches the highest audience, at 93% of Americans every week. Radio reaches 10 percent more Americans every week than mobile does.